Product prices and availability are accurate as of 2019-04-21 19:41:51 UTC and are subject to change. Any price and availability information displayed on http://www.amazon.com/ at the time of purchase will apply to the purchase of this product. Official Product of Ultimate Arms Gear, Brand New. Tactical Gear Set, Everything you Need to go on Operations or Callouts. Heavy-Duty Nylon Combat Vest is Covered with every Essential Piece of Combat Gear. Adjustable side width/height straps to fit most sized operators, rescue drag handle, metal shoulder loops, and a law enforcement nylon belt that fits up to a 51" waist, MOLLE compatible. Complete with heavy-duty zipper and patterned 3 quick-release buckles for secure fit and to enable the vest to be worn over body armor. This tactical set includes 2 drop leg platforms, 1 dump pouch, 1 ambidextrous holster for full sized autos with extra magazine pouch, 1 utility pouch, 2 open-top double rifle magazine pouches for AR-15s, 1 open-top double pistol magazine pouch for high-capacity mags & 1 GPS/cell phone pouch. 3 Well-designed mesh interior pockets (17"x14" - back pocket, 14"x11" - two zippered side pockets) for cooling comfort and storage of documents, maps and other survival items. Back mesh pocket can be used as a hydration bladder compartment. Tactical MOLLE Vest Includes: Radio/GPS/Cell Phone Pouch, 2 Open-Top Double Mag Pouches, Dual Pistol Mag Pouch, Medical/Utility Pouch, Heavy Duty Belt, Drop-leg Platform Ambi Holster & Drop-leg Platform Dump Pouch. Adjustable One Size Fits Most : Waist 34 to 55 inches, Vest length 21 to 23-Inch. Premium Heavy Duty Mililary Quality Weatherproof Nylon With Mesh Interior Pockets For Cooling Comfort And Storage Of Documents & Hydration Bladder. Fully Loaded And Fully Customizable For Countless Configurations. Front and Back Velcro System for ID Patches & Motivational Emblems. 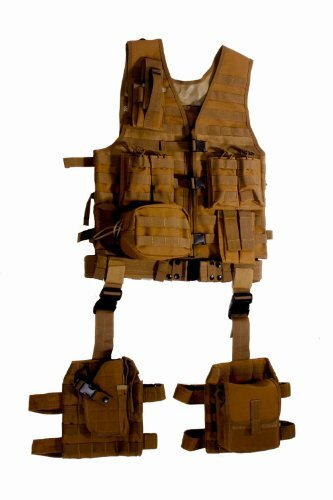 Vest Color: FDE Flat Dark Earth Tan.